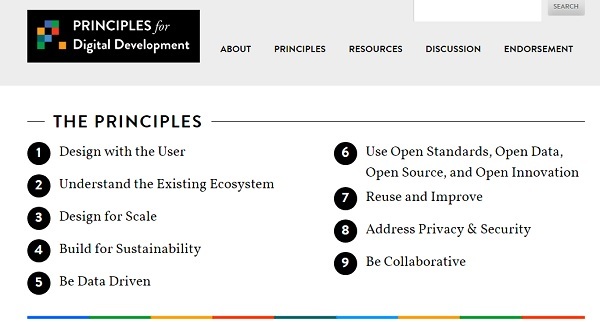 "Principles for Digital Development" are “living” guidelines to help development practitioners to integrate best practices into technology enabled programs. While the "Principle 5" invites users to "Be Data Driven", the "Principle 6" focuses on "Use of Open Data, Open Standards, Open Source, and Open Innovation" as a framework to consider an “Open” approach to technology-enabled international development. The Guidelines are the result of consultation with a number of international organizations and are written by and for international development donors, multilateral organizations, and implementing partners, and they are freely available for use by all. Although the Principles (along with case studies) are not intended to solve all open challenges to the fair, effective, sustainable, and secure use of technology in development projects, - they are, however, designed to encourage the institutionalization of existing best practices. Like the Principles themselves, the self-assessment process is designed to evolve over time in consultation with endorsing organizations. Click here for a list of organizations that have endorsed the Principles for Digital Development. Design projects so that impact can be measured at discrete milestones with a focus on outcomes rather than outputs. Evaluate innovative solutions and areas where there are gaps in data and evidence. Use real-time information to monitor and inform management decisions at all levels. When possible, leverage data as a by-product of user actions and transactions for assessments. "USE OF OPEN DATA, OPEN STANDARDS, OPEN SOURCE, AND OPEN INNOVATION"
Adopt and expand existing open standards. Open data and functionalities and expose them in documented APIs (Application Programming Interfaces) where use by a larger community is possible. Invest in software as a public good. Develop software to be open source by default with the code made available in public repositories and supported through developer communities. For more information on endorsement, please visit the Digital Principles for Digital Development website and/or email contact@digitalprinciples.org.